8.5x11, lxxxiv + 192 pp. The collection of motets in manuscript Paris, Bibliothèque nationale de France, fonds fr. 12615, known as the “Chansonnier de Noailles,” brings together ninety-one thirteenth-century motets in two to four parts, whose upper voices are all sung to vernacular texts. It is one of six diverse collections contained in the manuscript; it shares space with three different compilations of monophonic songs, a collection of songs and dits, various nonlyric texts, and several later additions, all gathered in a codex closely tied to the former northern province of Artois and in particular to the city of Arras. The motet collection is notable in several respects: with its ninety-one pieces it is the fourth-largest repository of thirteenth-century motets and the third-largest of motets in French; it is one of only two sizable sets of polyphonic motets preserved in provincial songbooks rather than Parisian collections, a fact that broadly affects the style of several groups of its motets; finally, it transmits an unusually high number of unica, due to the anthology’s inclusion in an Artesian chansonnier. Although the Chansonnier de Noailles has sparked the interest of bibliophiles and scholars since the first half of the eighteenth century, its faulty polyphonic notation has made editing the motets difficult; past editions have thus been incomplete and relied heavily upon concordant readings. 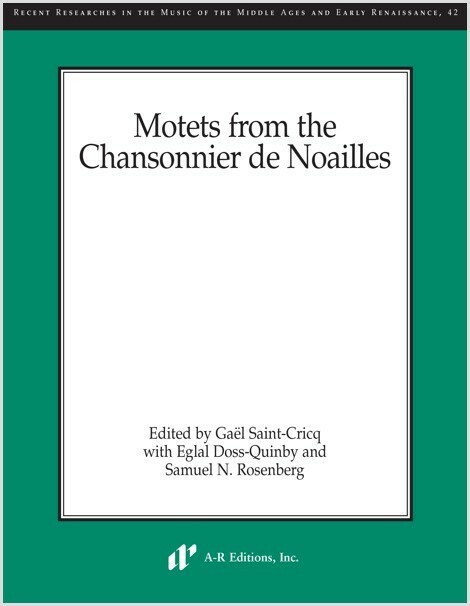 This volume presents the music and texts (with translations into English) of the motets from the Chansonnier de Noailles, for the first time published in a single, coordinated, comprehensive critical edition. 68. Aimi! aimmi! aimmi! Dieus!